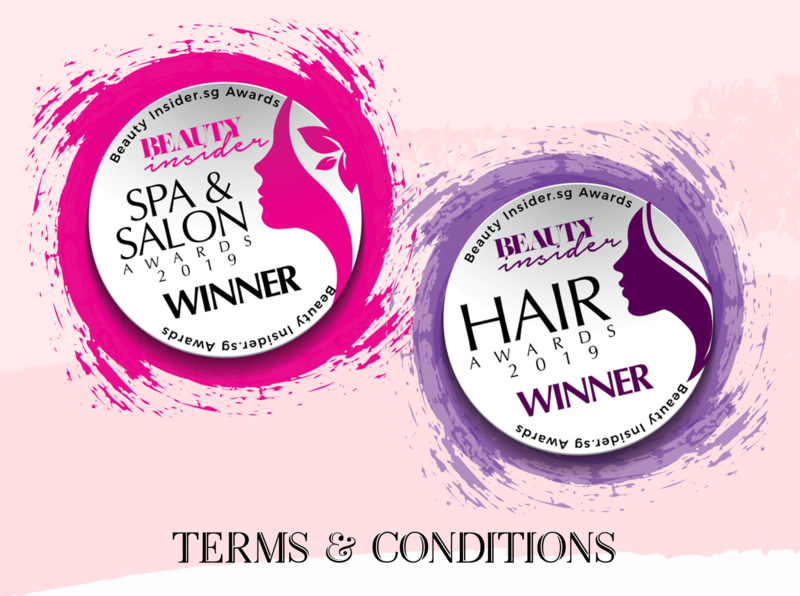 Spas, Beauty Salons, Salons, Nail Salons, Hair Salons, MediSpa, Aesthetic Clinics, collectively referred to as ‘establishments’ or ‘Nominees’ based in Singapore are eligible to participate in the 2019 Beauty Insider Spa & Salon Awards and 2019 Hair Awards, herein referred to as ‘awards’. ‘Beauty Insider’ herein referred to as ‘organizer’ of the awards. To be eligible for the awards, each nominee must have a minimum of two treatment rooms, self-contained, stand alone establishment with a dedicated address. Each nominee is entitled to submit an ‘Award nomination form’ for the categories as stated on the nomination form. A full nomination form must be completed and submitted online before the deadline of March 25, 2019. No entries submitted after the above date will be considered for the awards. There is no participation fee required for the submission of your nominations for the awards. Nominees with multiple locations will be recognized by their main location which must be stated on the nomination form. Supporting documents such as testimonials from your customers, reviews, previous awards won, writeups from the media is strongly encouraged and will be taken into account during shortlisting to the public voting round and also in the final award judging. After submission of nomination form, nominees will be subject to an approval & verification process to be shortlisted for the next round of the online public voting system on the Beauty Insider for confirmed shortlisted nominees only. Nominees will be featured within the public voting section under the ‘drop down’ menu for the categories they have selected subject to approval by the judging committee. The online Public Voting will be taken into account for the “Readers’ Choice” award. Nominees are encouraged to get their patrons and customers to vote for them using their own marketing efforts or also via the ‘award resources’ that will be shared with each nominee. These include banner ads, social media posters, badges etc that will be provided by Beauty Insider to each of the shortlisted establishment by notified by March 20th 2019. All voters are required to register for an account to identify each entry and each account is eligible to vote ONLY for one establishment per category. Votes are tallied by the number of unique votes that each establishment receives. The system does not allow voting for more than one nominee per subcategory from the same registered account. Any voting that seems fraudulent such as creation of multiple accounts from a single user will result in the disqualification of those votes. All votes are automatically saved in the backend ballot system. The public can change their vote at any time throughout the voting period. The icon will change from the "Vote" button to the "Voted!!" button. The public Voting Count will not be revealed on the frontend or to the nominees or to the public. The Organiser may also, in appropriate circumstances, and at its sole discretion, reject nominations that appear to be legally or otherwise problematic e.g. infringe the copyright or other intellectual property or establishments that do not offer professional services etc. Notwithstanding the above, the organiser will endeavour to display all nominations in the public voting section. The Organiser does not guarantee to display all nominations / categories that establishments have nominated themselves for. 1st April, using the online nomination form or email. The entire Judging Process will take one month. The shortlisted entries for the Public Voting System will be notified by 2nd April 2019. The public voting System closes on 16th April, 2359hrs. Winners will be notified via email by 23rd April 2019. Only votes from the online public voting system of Beauty Insider will be counted towards the judging. Social media votes on establishments’ social media channels, website etc will not count. Judging will be based on the voting from the public, selected site visits by the Beauty Insider team, supporting documents & information provided as stated in #9 and further research by the editorial and trial team of Beauty Insider. Judging will also take into account overall customer service reviews, Style, Innovation as stated in the nomination form. The nominee may have to host a judge, who maybe from the ‘VIP trial team’ of Beauty Insider or the Editorial Committee of Beauty Insider at their establishment for a site visit. This may include site inspection and / or testing out of treatments / services they have nominated themselves for, this will be done at no costs to the judges. The representative judge will hold accreditation from Beauty Insider and the establishment will be informed prior to coming down. Winners will be notified via email after the judging process by 23rd April 2019. If a winner is unreachable after seven (7) working days, or if that winner is unavailable for the award fulfilment, an alternate winner will be selected. If an eligible winner cannot be found for that category, it will not be awarded. Winners will be invited to consider various award packages to celebrate their achievement, which will entail a cost. Some items will not be chargeable and may be provided complimentary to the winner. The awards packages details will only be revealed to the winners and not released prior to the award notification date of 23rd April 2019. The organizer reserves the right to use any and all information related to the awards, including information on establishments for marketing, training or other purposes. The Awards and all of the related pages and contents are copyright to Beauty Insider. Copying or unauthorized use of any copyrighted materials, trademarks or any other intellectual property without the express written consent of the organizer is strictly prohibited. The organizer reserves the right to change or amend the rules, dates and will display any changes on the Website and inform nominees accordingly. The decision of the Organiser in relation to any dispute about the Rules, conduct, results and all other matters relating to the Competition is final and the organizer will not enter into correspondence with any nominee. The Organizer is not responsible for internet crashes, slowdowns caused by network congestion, viruses, sabotage, satellite failures, phone line failures, electrical outages, natural disasters or acts of man or God during the voting process. any damage, loss, injury or disappointment suffered by your entry into the awards or as a result of accepting of the award packages or collaterals provided by the organizer.